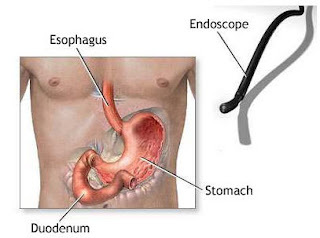 Endoscopy describes many procedures that look inside the body using some type of endoscope, a flexible tube with a small TV camera and a light on one end and an eyepiece on the other. The amount of preparation needed for endoscopy depends on what part of the body is being examined. For upper endoscopy, you will be instructed not to eat or drink for six to eight hours before the test. For bronchoscopy, you will need to follow restrictions on eating and drinking and take special precautions regarding your mouth and teeth. Your doctor will give you specific details. For colonoscopy, you will need to clear your bowels completely of stool before the procedure. To do this, you will modify your diet and take laxatives the day before the procedure. For sigmoidoscopy, you will need to have an enema before the test. Before any endoscopy, remind your doctor of your medical and surgical history. Tell your doctor if you have any allergies. If you are a woman and there is any chance that you may be pregnant, tell your doctor. Removal of a foreign body — Endoscopy allows doctors to find and remove foreign bodies from the upper lung airways or gastrointestinal tract. Diagnostic evaluation of symptoms — Upper endoscopy and colonoscopy allow doctors to view organs directly and take pictures of any abnormalities that may be causing symptoms such as abdominal pain or rectal bleeding. The doctor can remove a sample of tissue (biopsy) through the endoscope during the procedure. The doctor may also obtain images of nearby organs, such as the pancreas, by an ultrasound attachment to an endoscope.